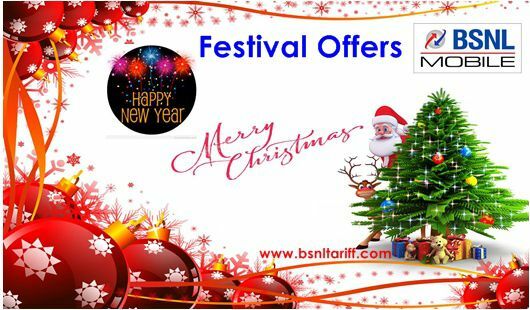 BSNL Mobile introduces Special Festival offer on account of Christmas and New Year 2016 for Punjab Telecom Circle Prepaid customers as promotional basis. State run Telecom Company Bharat Sanchar Nigam Limited (BSNL) has started Extra Talk Time festival offer on GSM mobile Prepaid vouchers in Punjab Telecom Circle for a period of 12 days as promotional basis. The Extra Talk Time offer on GSM mobile vouchers starting denomination from Rs.290/- to Rs.5000/- under Prepaid plans mobile services. Prepaid customer on Recharge of Topup Rs.290/- will get total Talk value of Rs.320/- i.e extra talk value of Rs.30. On Recharge of Topup Rs.390/- will get total Talk value of Rs.433/- i.e extra talk value of Rs.43. Prepaid customer on Recharge of Topup Rs.890/- will get total Talk value of Rs.1000/- i.e extra talk value of Rs.110. On Recharge of Topup Rs.2000/- will get total Talk value of Rs.2300/- i.e extra talk value of Rs.300. Prepaid customer on Recharge of Topup Rs.3000/- will get total Talk value of Rs.3450/- i.e extra talk value of Rs.450. On Recharge of Topup Rs.5000/- will get total Talk value of Rs.6000/- i.e extra talk value of Rs.1000/-. Note: The above Extra Talk Time offer will not be applicable to GSM PCO Prepaid vouchers. The above promotional offers will be implemented with effect from 21-12-2015 to 02-01-2016.